provide foam pillows and remove duvet inserts. Also by request we can wash sheets and all towels with just water, no chemicals. The instantly iconic Standard High Line finds its stride offering an artistic and socially conscious culture in the Meatpacking District. Hovering over, better yet, straddling over a former elevated train line turned downtown New York’s most talked about park, is the 20-story, stark concrete and glass, Standard High Line. 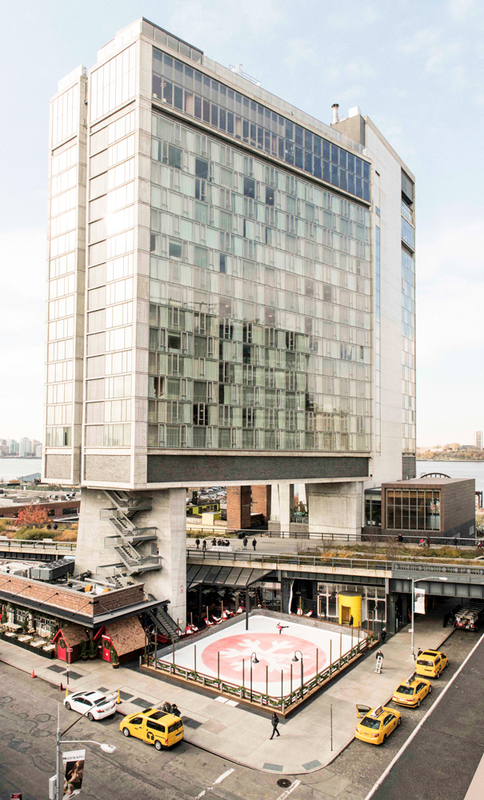 Located in a trend-centric enclave of the Meatpacking District, the hotel’s design pays homage to the industrial (and somewhat seedy) history of the neighborhood, as well as a tip of the hat to mid-century Scandinavian architecture. 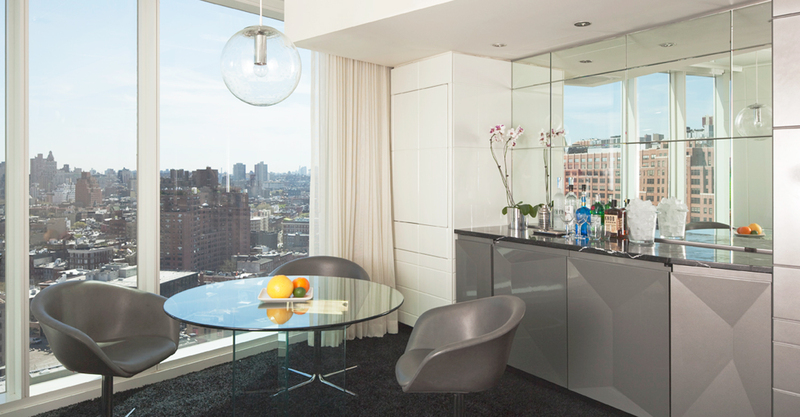 Floor-to-ceiling starphire glass windows offer majestic sweeping views of the Hudson and Manhattan skyline, likewise, an almost as enticing view can be had from the street (if you forget to draw those shades). Apropos for a brand that has become known for its implied sexiness as much as its playful irony. Enter the giant bright yellow revolving door to the lobby to find an interior as striking as its counterpart. Dark marble plinths amid mirrored ceilings set the tone for a property that has had the downtown gadabouts flocking. Not to mention, having an outdoor plaza featuring rotating art installations that turns into a late night ice skating rink in winter, a neighborhood and celeb staple resto, a traditional German Biergarten with rotating beers and ping-pong and a penthouse discotheque, complete with plunge pool and world renowned DJ’s might help a bit, too. But what really has us jazzed is the Standard’s ethos of culture and diversity. They’ve pledged to create an environment that brings people together in ways that allow differences to shine through and inhibitions to fall away, celebrating a diverse employee culture and clientele that celebrates interconnection, radical self-expression and the spirit of travel (hold for applause). View, views, views. Need we say more? 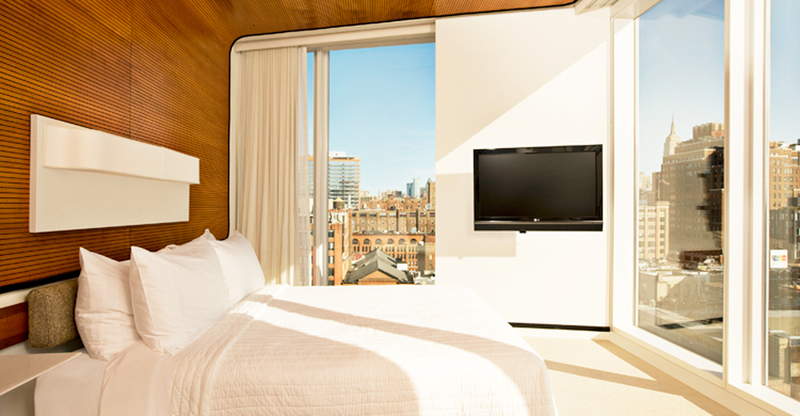 The 338 ultra-mod rooms and suites all feature floor-to-ceiling windows and some out of this world “pinch me” views of the city. Choose a room that faces uptown and wake up in your super comfy bed swathed in 300 thread-count Italian sheets and greet the Empire State Building, or face south and cheers the Statue of Liberty with a drink from your overstocked, that’s right, overstocked mini-bar. 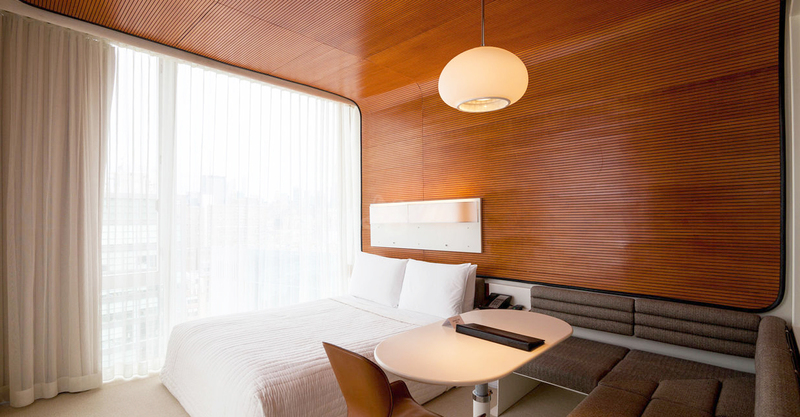 All rooms are bright, sleekly furnished with wood slat accents and mid century mod elegance. Add to that huge TV’s, Bluetooth speakers, fluffy down pillows, mood lighting, free WiFi and did we mention the views? 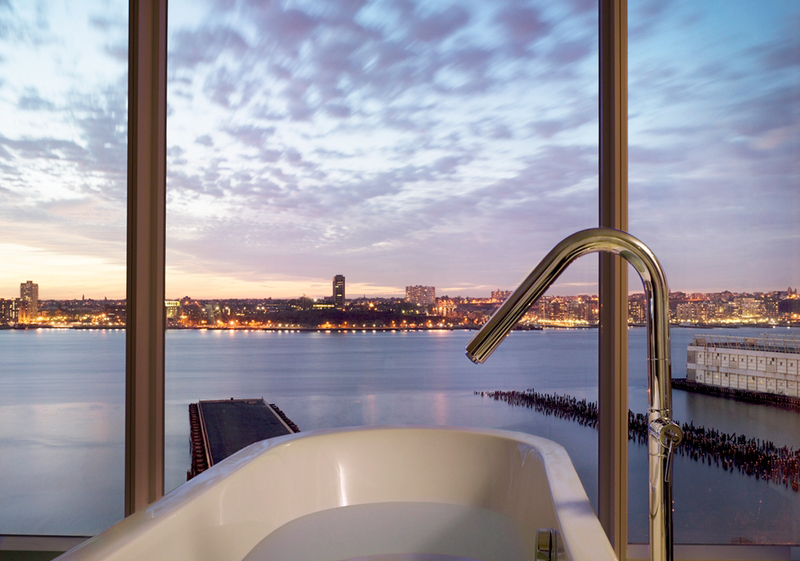 While you’re gazing out at the city in your deep soaking tub (depending on room), you can indulge yourself with KISS MY FACE bath products -- a company maintaining a healthy respect for the planet, making naturally effective, chemical and animal-free organic products for 35 years, (the sage mint shower gel is a personal fave). 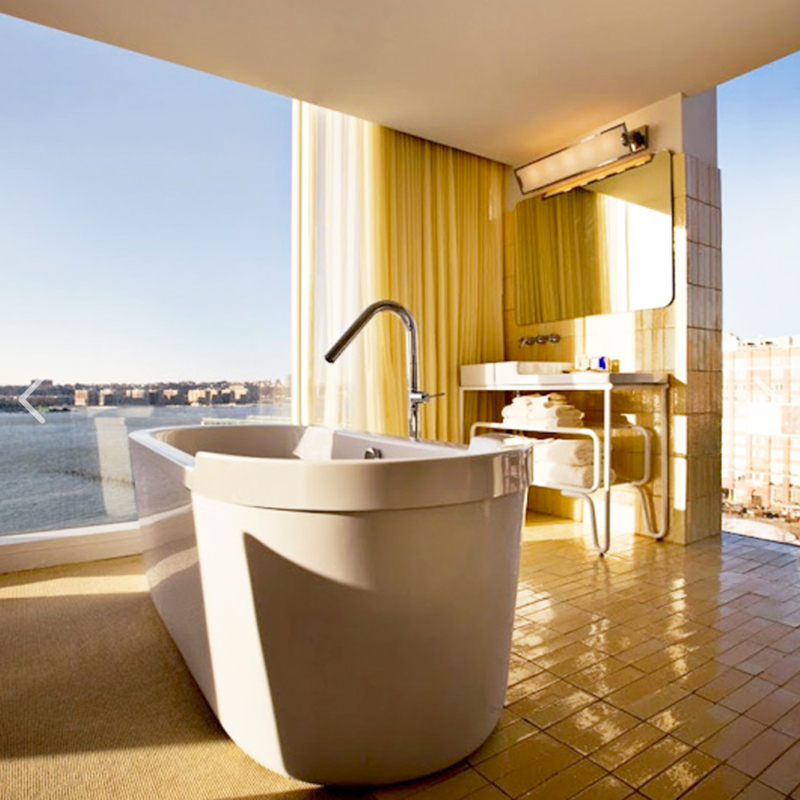 Good news for the unabashed, too, all bathrooms are open concept with rainfall showers and surrounded by glass panes. Again, more views. Oh, your furry four-legged friends are welcome to stay free and the hotel has amenities for them, too. 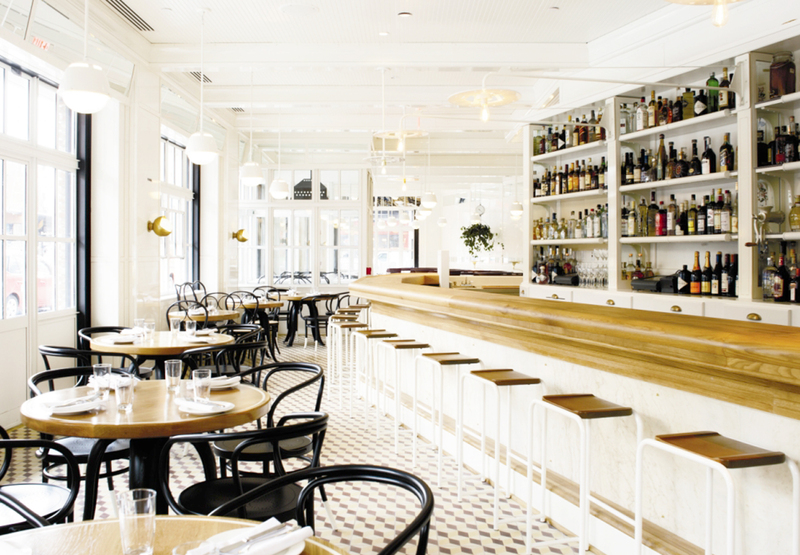 The Standard Grill – This indoor/outdoor cafe is classic New York updated in all the right places. A lively bar scene and scenester haunt with a bright tiled front room and a more formal and sinister red leather boothed back room, including the stunning penny-tiled floor (460,000 of them to be exact). The kitchen utilizes the freshest local ingredients, blending traditional steakhouse and American nouveau cuisine. Vegan options, such as the roasted eggplant with spicy carrots, peanuts and sesame (hold the yogurt) can be enjoyed along with seasonal salads and veggies. Open for breakfast, lunch, dinner with late night bites til 3AM for the pre-post party crowd. A specialty midnight cocktail menu also comes out to play. Side note: reservations are suggested for the back room and patio. Standard Plaza - This street level public square features outdoor seasonal dishes on the healthier side- think salads, thin pizzas covered with organic produce and crafted cocktails and wines alongside rotating public art displays til 4AM. The winter months bring the Rink, an Alpine-inspired ice skating experience and a warm and comfy drink menu, think Toddy’s, Ciders and decadent hot chocolates (white & dark). Apres ski anyone? Standard Biergarten - Playing free ping-pong under the trestles of the High Line got you working up an appetite? No worries, nosh on traditional sausages and gigantic pretzels from chef Kurt Gutenbrunner and wash it down with one of the German beers continually on rotation. This lively spot will have you experiencing Oktoberfest year round. Open afternoons til late night. Le Bain - Located on the 18th floor and rooftop is this two-story Parisian inspired discotheque, replete with jaw-dropping views and downtown fashionistas. The stunning indoor/outdoor venue features world famous DJ’s and a plunge pool for the adventurous. 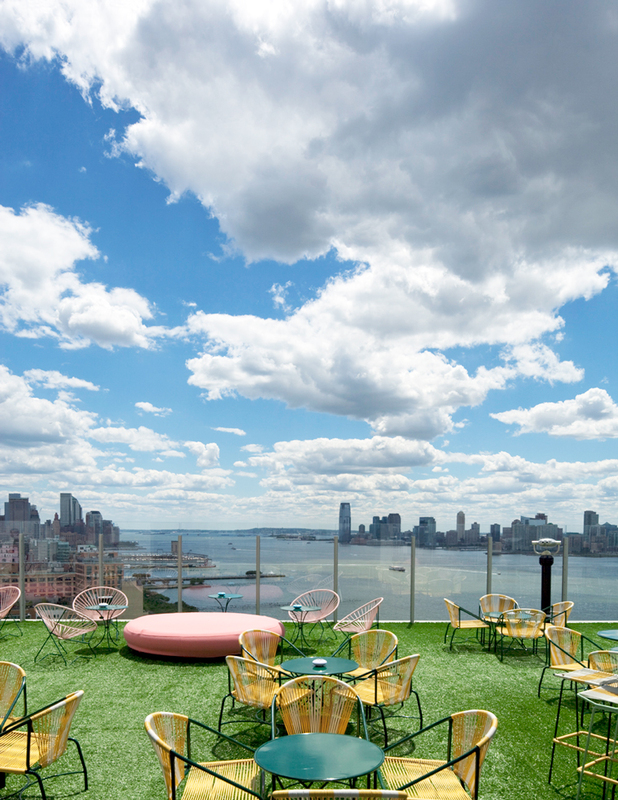 A weekend afternoon of rooftop cocktails, lounging on faux grass while enjoying a crepe from the rooftop creperie is an absolute must. We’re talking warmer months, of course. Stay up on the happenings. Side note: Admission is determined at entrance and not guaranteed to hotel guests. So, look sharp, and always be Kind! Dark Mon & Tues.
Top of the Standard - This gorgeous room shimmers in glamour and 1940’s elegance. After all, competing with the eighteen foot glass windows and the glow of the vibrant city in all directions takes some brass...and cream leather, and sparkling carpets (you get where we’re going here). This glittering room of late night lore is equally alive during sunset service. Guests are welcome to enjoy afternoon teas and drinks amid spectacular views. The evenings offer live jazz, a small plates menu and specialty cocktails. Truly a sophisticated supper lounge, this one. The room is smart and you’ll be wise to dress as such. Reservations strongly suggested here, guys. 4-Midnight on Mon, Tues. Wed-Sat opens at 4 and closes at 9pm (to welcome the members only club that follows). A 24 hour Room Service menu is available featuring breakfast, lunch & dinner. Willpower alert: fluffernutter and a chocolate mousse for two can be had upon request. 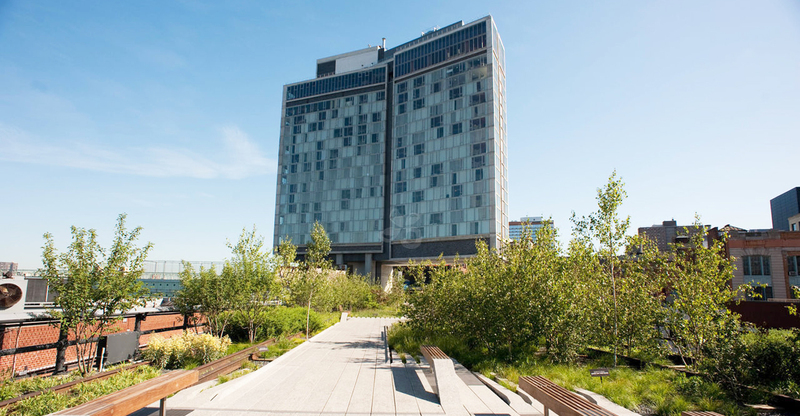 Since we’re on top of the High Line, what better way to destress than with a jog or brisk jaunt down this 1 ½ mile aerial greenway. Taking in the Manhattan’s West Side from 30ft up, you can stroll the track walks surrounded by a plant and tree selection that favors native (all within a 100mi radius), drought-tolerant and low maintenance species, cutting down on resources for landscaping. Stylishly sleek bikes can also be rented for $10/day, take a leisurely cruise up to the historic meatpacking district enjoying the newly re-purposed roads with wider bike lanes. 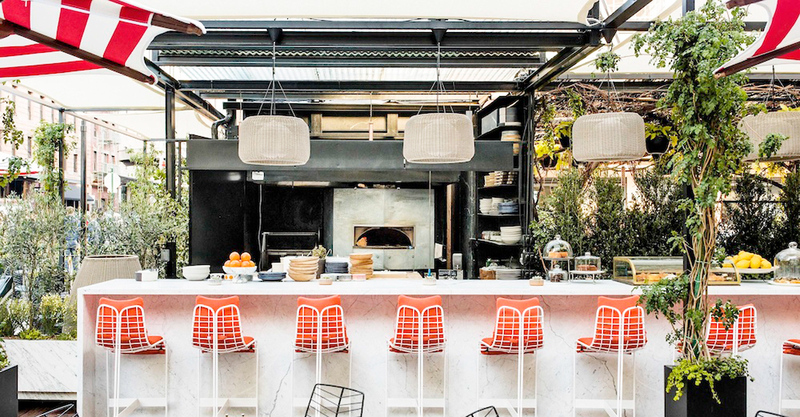 The Gym at the Standard is anything but. Open 24 hours with stretching views from the 17th floor of the Hudson and city, you can pretend you’re riding to Jersey on one of the stylish and wonderfully addictive Peloton bikes. This state-of-art facility also features elliptical machines, treadmills, yoga balls and free weights. Standard rooms (king, queen) are on the small side, 250 sq ft. but, hey, this is NY. All feature floor-to-ceiling windows and crazy comfy beds with Italian linens, a working/dining alcove, rain showers with tubs and cozy hooded robes to well, cozy up in. Superior Standard rooms are the same, but floors 11 and up. Deluxe King and Queen rooms are slightly smaller at 230ft. But feature a slightly different layout for more exceptional views of downtown and the Hudson, think bed next to the window. Also note, this room features slats on the shower/tub for added privacy from roommate if needed. Corner King is more spacious with two walls of floor-to-ceiling glass, and an over-sized free-standing tub in front of a wall of windows. 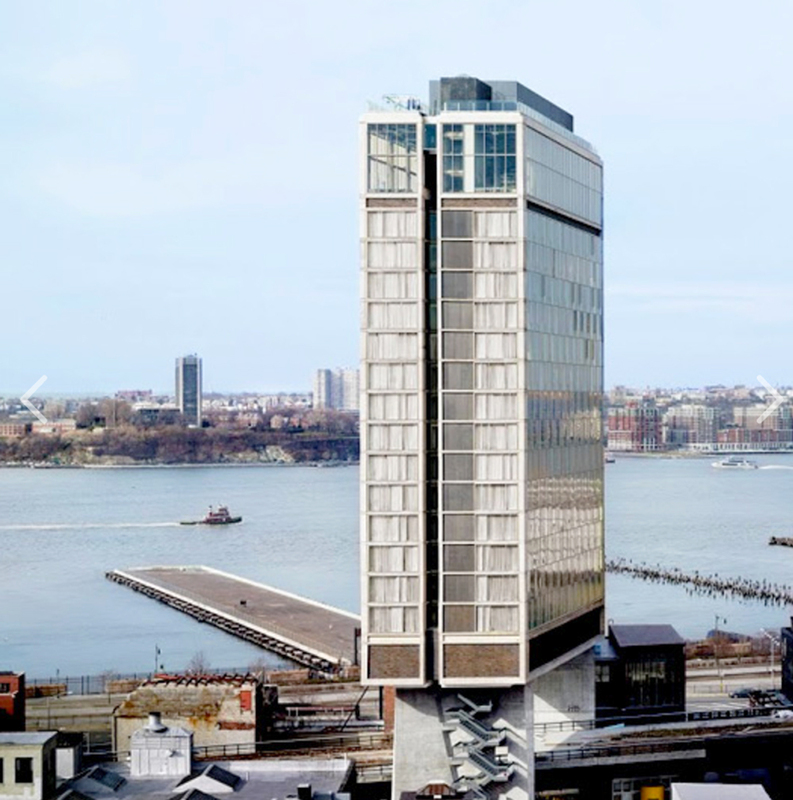 The Hudson Studio is the most in-demand room, you’ll be hard-pressed to find an inch of the 400 sq ft. that doesn’t have a spectacular sunset view (including from the free-standing tub and all glass-enclosed rainshower)! The Liberty Studio is a wood-paneled adult playground. 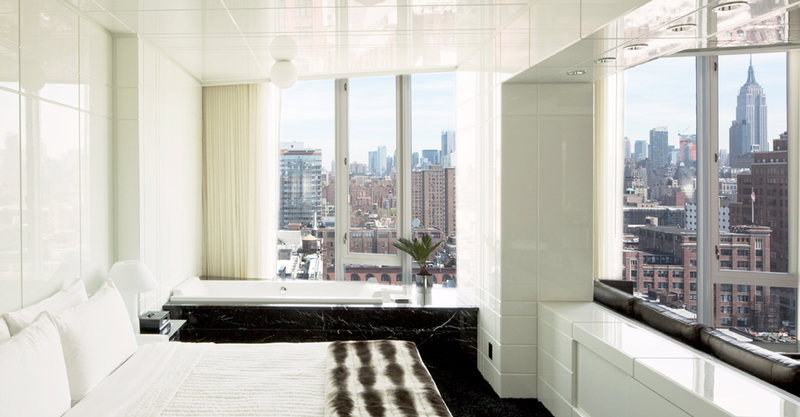 This spacious 575 sq ft suite features a seven-foot round platform bed, teacup bathtub for two (ahem) and huge views. It’s also decked out with carpeted platform lounging areas, a dining table for 6, an adjoining separate bedroom, fully stocked wet bar and a walk in shower for two. When can we move in? The Empire Studio is the creme de la creme, we’re talking top floor 875 sq ft (huge for NY standards), two separate living rooms (one with full wet bar), dining table for four, powder room, and a shag carpet. 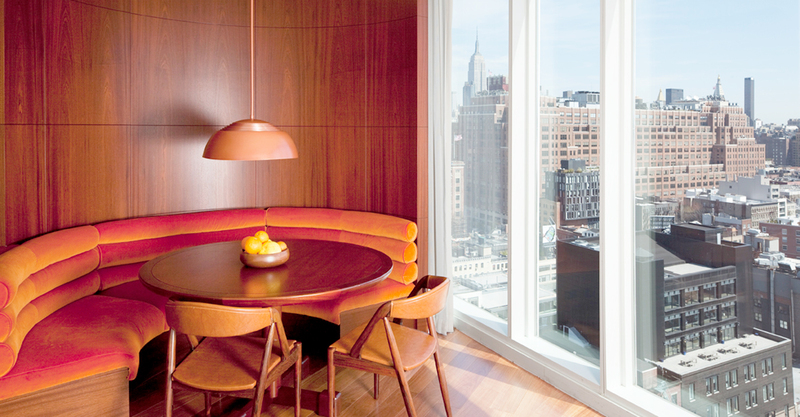 The second living room has two deep set leather couches that look onto the Empire State Building. The bedroom has a super comfy king size bed and an irresponsibly large walk in shower. All views and a top of the line sound system come standard. Parking will be charged at $85 + taxes per/day for oversized vehicles (SUVs) and USD 65 plus taxes per day for non-oversized vehicles. No in and out privileges are offered. Please note that an amount of $200 will be authorised for incidentals. The Wild Son is an industrial chic resto in the nearby MP serving breakfast, lunch and dinner with emphasis on healthy proteins, i.e. veggies, grains and greens. Not to mention fab cocktails and organic wines. Get the cauliflower sandwich. For 100% vegan and to-die-for quinoa hash browns head to the adorably stylish by Chloe in the Flatiron district. Untitled at the Whitney is contemporary American by beloved Gramercy Tavern chef, Michael Anthony, known for his vegetable forward thinking. We’d be remiss were we not to suggest local fave Spotted Pig. Cruise the few blocks over on your rented bike, you need to work it off afterwards. Hit the neighboring Whitney Museum (itself a work of art) for groundbreaking artists. For one of the most renowned collections of modern art in the world, Uber it to MoMa (pronounced Moe-Ma). The Guggenheim on the Upper East is one of the most important buildings of the 20th Century. Oh yeah, there’s art inside, too. No trip to Manhattan would be complete without a day in Central Park. Do everything from catch a concert, watch a play, watch people, jog, rent a canoe, take a horse drawn carriage, see wild and exotic animals, or, just picnic on the Great Lawn and take in the greatest city in the world. Chelsea Piers, just a short jaunt up the West Side Highway, is New York’s ultimate playground, not to mention a great place for eats and drinks. The nearby Gansevoort Market began as an open-air produce market in 1884 and has since been re-born, complete with its original industrial charm. Find a curated selection of locally produced goods and fare with communal spaces to eat and relax. Support local purveyors and artists at the renowned and lively Union Square Greenmarket. Mon, Weds, Fridays & Saturdays, year-round. Since you’re neighbors now, join The Friends of the Highline organization and adopt a plant, and help them support the local park (they raise 98% of the park’s annual budget) by keeping it thriving and vibrant. Donate time or $$ to the Bowery Mission, a vital part of the Lower East Side that has provided food, shelter, medical care as well a family support and mentoring programs since 1879. Visit the 9/11 Memorial and Museum and get involved, donate, reflect, appreciate. Multi-level classes in the Vinyasa tradition are offered in a bright and chic studio with traditional decor at Yogamaya. A savvy 24 hour concierge is available to guests, this bodes well for all of your “in-the-know” urban explorations. All local airports offer train service to Penn Station. 14min from Penn Station on A, C, E Lines. Three block walk from station at 14th St. & 8th Ave. Buses leave Port Authority Bus Terminal every 6 min from 42nd st. exit at 14th st and 8th Ave stop and short three block walk westward to hotel. The hotel offers parking for $65 for 24 hours.